I’ve been a fan of Bruce Mancefield ever since I became addicted to breakfast radio on 3AW when I was in secondary school in the 1980s. Back then, Bruce (better known as Uncle Roy) was the breakfast announcer along with comedian John Blackman. Together they helped me get up in the mornings, have breakfast and get to school. Much like Ross and John from 3AW do each morning these days. 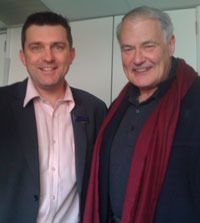 I first met Bruce 4 years ago when came to Strathcona to do some voice overs for the Strathcona Brownlow Medal Breakfast (did you know that the first official AFL event for Grand Final week each year is the Strathcona Brownlow Medal Breakfast – now in it’s 19th year?). This year he kindly did some voice overs for STV (Strathcona Television). When I see Bruce I’ll often remind him of the time he worked at Channel 9 with my Grandfather Ron Wilson who was the studio manager in the 1970s. Ron was an elite athlete (runner & VFL Footballer) in the 1940s & 50s and Bruce remembers him as a great sportsman and well loved member of the Channel 9 family.